Mighty Clean is a Certified Carpet Cleaning Company serving Ashburn, Virginia and surrounding areas. At Mighty Clean we guarantee the deepest most thorough cleaning around.We offer Carpet Cleaning, Upholstery Cleaning, Tile and Grout Cleaning, Mattress Cleaning, Carpet and Fabric Protection, and more. When it’s time to hire a professional cleaning firm, look for some one you can trust to deliver outstanding results you will be pleased with long after the job is done. Look to us for your Commercial Carpet Cleaning needs for your office as well. Why Ashburn, VA residents trust Mighty Clean for their carpet cleaning needs. When you call Mighty Clean Carpet Care, you don’t just get some guy with cleaning equipment. Our professional carpet cleaning technicians go through extensive training to learn the chemistry behind the solutions they use. Technicians are certified by the I.I.C.R.C. and trained to ensure they know the most effective ways to remove soils, tough stains, and protect your carpets to ensure they last for years to come. 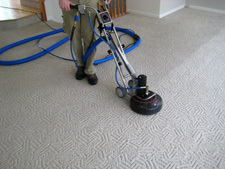 Our carpet cleaning system utilizes the Hot Water Extraction (Steam Cleaning) method recommended by the major carpet manufacturers including Shaw Industries. Just as the best method for cleaning clothes requires hot water, detergent, and agitation, so does cleaning your carpets. Professional Equipment for Professional Results! We use only professional grade equipment, from our 4 stage HEPA filtration pre vacuum to our rotary extraction cleaning wands. Our Truck Mounted cleaning units are TOP of the line and maintained on a regular basis, some companies use old out-dated equipment that beaks down and will likely leave carpet wetter which can lead to many problems. Ashburn Residents love our Guarantee! We guarantee your satisfaction the first time every time. If you’re not totally satisfied with the results following your cleaning, we’ll return to clean any areas of concern at no cost to you. If for whatever reason your still not totally satisfied we’ll refund your money no questions asked. When it’s time to have your office carpets cleaned we offer competitive pricing and maintenance contracts for commercial office carpet cleaning in Ashburn. Low pile glue down is the most common commercial carpeting and we have developed the perfect commercial cleaning process for this specific flooring. Here is an example of berber carpeted stairs we cleaned in Ashburn, you can clearly see the difference in the before and after. We also cleaned carpet in a sun room for this customer to remove pet odor and a little pet staining. Berber can be tougher to clean, however when it is cleaned properly the results can be much more obvious because so much of the build up of soils and oils sit right on top, as apposed to “cut pile” carpet where they hide beneath the surface! 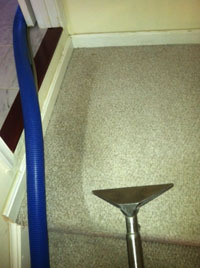 Here is an example of Nylon cut pile carpet we cleaned in Ashburn. 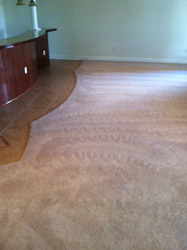 This was a move in carpet cleaning job for a referral customer. The customers main concern was removing any old dust and dander left behind by the previous owner and their pets. We cleaned all of the carpet in the house including 3 sets of stairs, basement, bedrooms, and the main level.This picture is of the rec room, notice the design in the carpet to tile transition. Obviously this doesn’t effect the cleaning, but it is pretty cool to see how creative people can get… the installer must have been pretty skilled to pull this off on both the tile and carpet with no transition piece to cover defects! Kevin and Mike were very professional and very competitive on their pricing. They arrived on time and finished the job on schedule. They worked hard on some ink stains and well exceeded my expectations. Overall it was a pleasure doing business with Mighty Clean.- Ronna R.
is an unincorporated area located in Loudoun County, Virginia, 30 miles (48 km) northwest of Washington, D.C., and is part of the Washington Metropolitan Area. 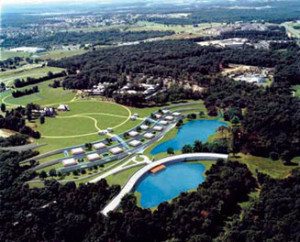 The area serves as headquarters for the internet service provider Verizon Business, and the Janelia Farm Research Campus (HHMI). 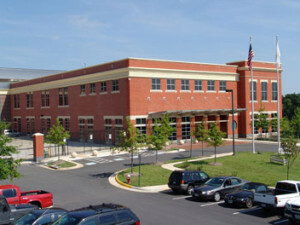 “Redskins Park”, the headquarters for the Washington Redskins football team of the National Football League, is also located in Ashburn. Ashburn was originally called Farmwell (variant names include Old Farmwell and Farmwell Station) after a nearby mansion of that name owned by George Lee III. In 1895, Ashburn Farm was purchased by Senator William Morris Stewart. Local legend has it that the village, known until then as Farmwell or Farmwell Station, got its new name after lightning struck an ash tree on Senator Stewart’s farm in 1896. The ash tree is rumored to have burned and smoldered for a week and attracted spectators from miles around. Since the Post Office had been pressing for a new name for the village (to avoid confusion with Farmville in Prince Edward County, Virginia), and the Senator was the area’s leading citizen, the villagers renamed the village after the burning ash tree. Ashburn was also the vacation destination of many Presidents, like Woodrow Wilson, as well as many of Washington’s other politicians. They would take the only Washington and Old Dominion Railroad line out to Ashburn, which contained some upscale hotels and restaurants. Most of these hotels and restaurants have long since been destroyed or dismantled, but a few can still be seen along the main street of Ashburn Road.